Of the tens of thousands of watches that I have held in my hands, this is the coolest and most interesting of them all. In 2008, Vacheron Constantin released the Metiers d’Art Les Masques limited edition series of four watches, with each watch produced in only 25 pieces. The mask watches celebrate primitive art, in the form of masks. The inspiration for the watches came from Geneva’s Barbie Muller Museum, which houses a fantastic collection on primitive arts. Once the inspiration was realized, selecting which masks to reproduce was difficult. However, the real difficulty came in making perfect miniature reproductions of the chosen masks. The museum actually lent the selected masks to Vacheron, whose artisans tried various means of miniaturization, but none were satisfactory. Finally, Vacheron engaged the Geneva Engineering School for assistance, and the process of miniaturizing the masks was perfected. 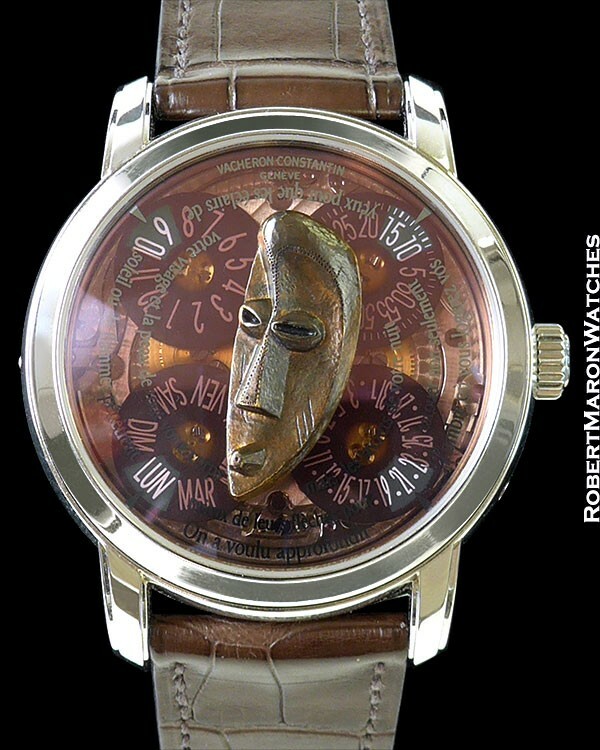 This watch features the Etoumbi-Mahongwe mask from the Congo. Incidentally, art historians assert that this mask was the inspiration for some of Pablo Picasso’s early twentieth century works. Platinum case with 41mm by 13mm dimensions, stepped lugs, sapphire front and display back crystals and signed crown. Dial is awe inspiring. 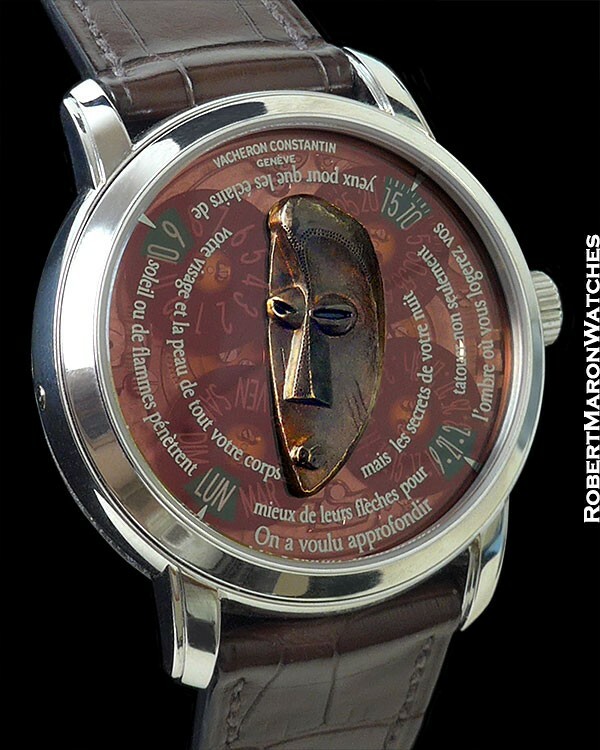 There is a tinted disc with a poem dedicated to the mask by French poet Michel Butor. In fact, there are several, slightly differently tinted discs, displaying varying layers of information, and all designed to flatter and draw attention to the miniature mask. 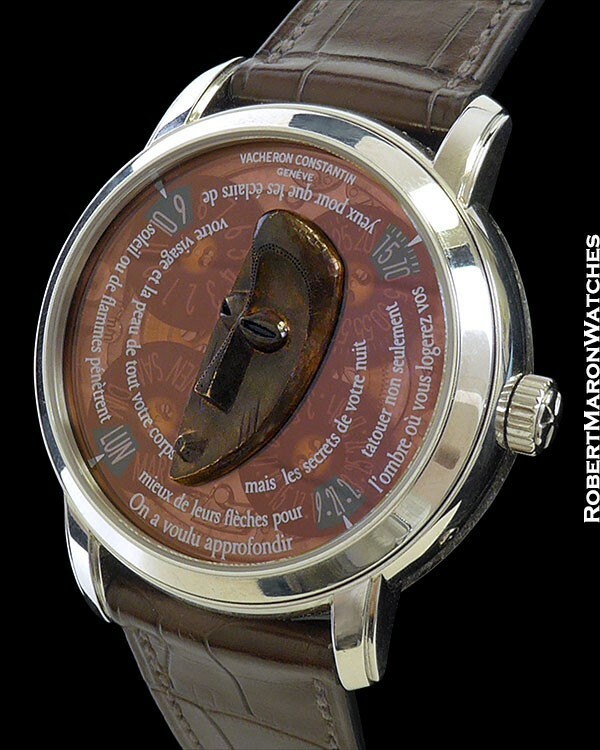 The time display is in four apertures that display the hours, minutes, days and date. 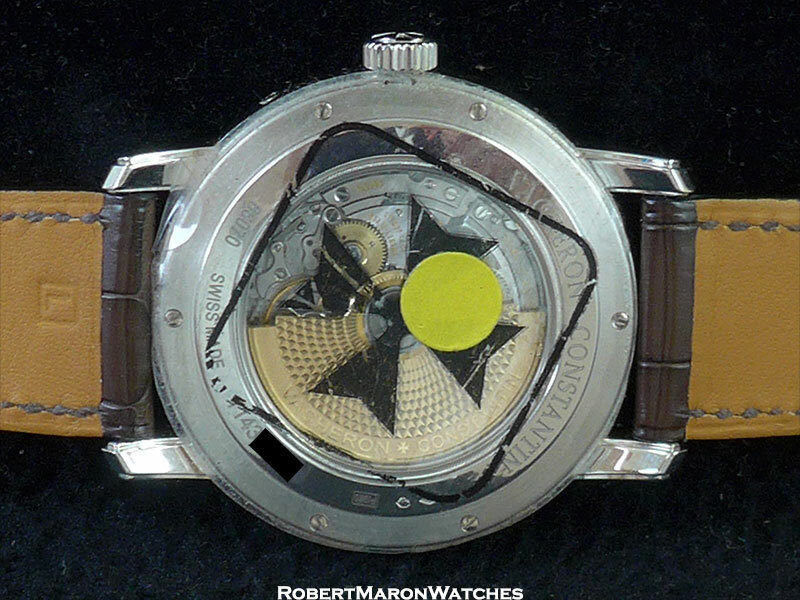 Vacheron Constantin automatic winding Caliber 2460 with 27 jewels and stamped with the Geneva Seal. Decorated and signed solid gold winding rotor.